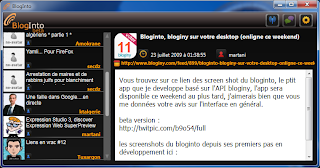 BlogInto is a desktop client that let you use bloginy from your desktop (like TweetDeck for twitter), it uses the bloginy API and some standalone functionalities to retrieve and show feeds and their associating information like user avatars and so on. The current release is so basic, it's a beta version and it supports all the features available in the API so far. It’s built mainly on the .NET Framework using WPF and Linq. If you have the .NET Framework 3.5 SP1 you can download the non-installable version (140 Ko) or you can download the installable one (1 Mo) and benefits from automatic updates and shortcuts on the Start menu and the desktop. Portable code: execute without installing. We tested BlogInto on Windows 7 (main host), Winows Vista and Windows XP, but it would work normally under Windows 2003 and 2008 too. 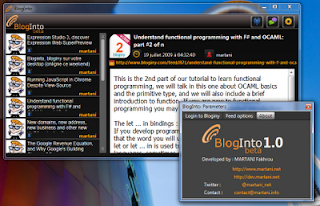 The only component BlogInto need to run is the .NET Framework 3.5 sp1, if you run the installer of BlogInto it'll install the .NET framework 3.5 first if it's missing, but I suggest that you install it yourself then install BlogInto. You may also leave a comment here indicating problems you might encounter. A : For now BlogInto run only on the Windows operating system (don't be sad), but, the good news is that we work on the next version, maybe with the apparition of the API 2, and we will make it running on Silverlight instead of WPF, so Mac users, you are on our next list, Silverlight 3 is totally supported on Mac and Windows. Q: What if you include a spyware or a Trojan with that "BlogONTO"
Q: Ok, ok, but how I trust you? 5.Q: Why you are providing shorned URL's for the downloads? A: I'm trying to keep an eye and do some statistics on how much the application was dowloaded, which period of time and so on. Q. Is it open source, or at least can we see the code? 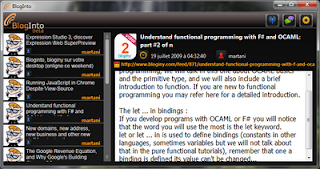 Posted in bloginto, linq, wpf . Bookmark the permalink. RSS feed for this post.